93% of consumers describe their hair as dry, damaged or color treated. Along with using the right shampoo and conditioner your hair needs regular treatments to repair and strengthen damage done to the internal structure of your hair and the outer cuticle layer. Paul Mitchell has known about the restorative properties of the Awapuhi plant for 30 years. In Hawaii the natives use the juice of this plant to cleanse and add shine to their dark rich hair. 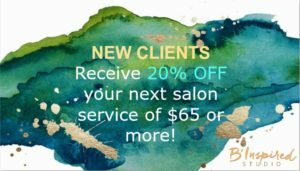 As a fully booked stylist I am always looking for ways to increase the longevity of client’s color, strengthen fine or damaged strands and increase shine. The Awapuhi Wild Ginger Treatment is Paul Mitchell’s award winning answer for dry damaged hair. This two step treatment starts with Moisturizing Lather Shampoo. Excess water is squeezed out before the KeraTriplex blend penetrates repairs and seals. Finally Keratin Intensive Treatment is added and massaged into the hair. The hair is covered with a plastic cap and heat is applied for 10 minutes. This summer I’m treating guest’s hair from the inside out. With nine luxury products featuring proven ingredients to restore dry, damaged hair.